The holiday season is certainly in full swing and a long break from school is fast approaching. Feeding children can take a lot of effort when things are in a “normal routine.” Traveling or having family visit can be an added challenge with feeding, especially with picky eaters. Then, you add in irregular meal times, erratic sleep schedules, lots of exciting yummy foods, new challenging foods, and a man entering the house in the middle of the night and leaving presents! This can certainly be a recipe for lots of fun, but also lots of stress around kids’ eating. I don’t know about you, but I love gift guides. They give me new ideas and they’re just fun to read. We’re on a gift list roll right now! This is our 4th and final gift list in our series. Click these links to read the previous guides if you missed them or want to revisit them: 13 Favorite Kitchen Essentials That Make Great Gifts, Nutrition and Body Books for Parents and Kids and 7 Nutrition and Body Books for Adults. We hope ours have helped you find some great gifts for loved ones or for yourself. Anyone who has been to my house has seen my shelves of cookbooks (and there are even more on shelves in the basement). I absolutely love cookbooks! I read them like novels. There’s always a stack next to my bed sitting amidst the other books I’m reading. 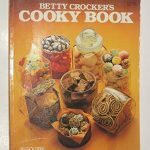 A babysitter gave me my first cookbook when I was 9 or 10. I still have it! You can always learn something new when you open up a cookbook. A great cookbook will teach you to cook with easy to follow instructions and a reasonable number of easy to find ingredients. (There are great cookbooks that teach challenging techniques that include recipes with lots of ingredients, but that’s not what this guide is about). A cookbook can also offer a trip to new parts of the world, history lessons, and even some science. Cookbooks offer opportunities for creativity – combining taste, texture, and colors in new or different ways. In great cookbooks, each author’s writing style and the photography or drawings also pull you in. Wonderful cookbooks will make you feel inspired and empowered to cook. 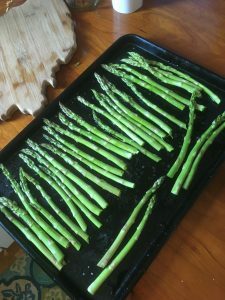 For this post, I decided to stick with just a few recommendations for cookbooks that make cooking accessible. I’ve also included a few that delve into cooking that’s not quite as simple, but fun for anyone who enjoys cooking. It was hard to narrow them down! This book is the first on the list, because it’s my current favorite. I love everything about this book! The first half of the book is divided into 4 sections that correspond to the 4 words of the title. You’ll learn how each element works and how to use them in your cooking. The illustrations are more intricate than those you find in most cookbooks. In “How to Use This Book,” Nosrat writes that the choice to use illustrations instead of photos is to prevent you from feeling like there’s only one way for a dish to look. If you’re interested in food and the science of cooking and want to learn the essential elements, get this book! Most of the recipes are easy to follow with just a few ingredients. If you haven’t had a chance to watch the Netflix episodes, (you can watch the trailer here) make sure you put this at the top of your list. This 4 part series warms my heart. I know that might seem hard to believe, but it’s such a pleasure to watch. This is one of Anna and her husband, Dan’s, go-to cookbooks. 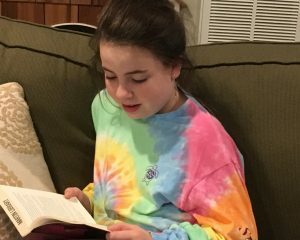 Anna loves the book because everything is explained in a straightforward way. The recipes are simple and have just a few ingredients. Dan likes the book because the recipes don’t require buying unusual ingredients that are only used once and then end up sitting in the refrigerator for ages. Are you looking for a gift with a theme of body positivity, self care, or leaving diets behind? We hope you enjoyed our first post with a list of books for parents, caregivers and kids that would make great gifts. We’ve now pulled together a list of our favorite nutrition and body books for adults. There’s so much media out there telling us that we need to do more and that we’re not enough. These books strive to be the antithesis of that. Do you or someone on your list need a bit more self focus or TLC? Would you like to spread the non-diet message this holiday season? Maybe, introduce or reintroduce someone on your list to the idea that controlling your body or making yourself smaller doesn’t solve problems. Or, buy one of these fabulous books for yourself and focus on your own self care next year. 1. Eating Instinct by: Virginia Sole-Smith Sole-Smith became interested in how we learn to eat the way we do, when her own infant daughter stopped eating. She realized that so many of us struggle with eating and set out to understand why. This book asks three important questions: How did we learn to eat this way? Why is it so hard to feel good about food? And how can we make it better? It is so refreshing for someone outside of the eating disorders field to fully “get” the complexities of food, nutrition and why people eat the way they do. 2. Body Respect: What Conventional Health Books Get Wrong, Leave Out, and Just Plain Fail to Understand About Weight by: Linda Bacon and Lucy Aphramor Linda Bacon, the author of Health at Every Size, co-wrote this book that is powerful and eye-opening! It’s a quicker and easier read than Bacon’s first book and breaks down both the research, but also importance, of treating people with respect and kindness, including ourselves. This is a great book for anyone who is ready to leave diets behind and wants to understand why weight does not define health. 3. Intuitive Eating book or workbook by: Elyse Resch and Evelyn Tribole Intuitive Eating helps the reader break free from diet culture and return to using internal cues. The authors published The Intuitive Eating Workbook in 2016 and it has been a fabulous resource with actionable steps. 4. EveryBody Yoga: Let Go of the Fear, Get on the Mat, Love Your Body by: Jessamyn Stanley This book, complete with fabulous photos of yoga poses for the reader to be able to learn, is the first of its kind. You see many different bodies in the photos and it is certainly free of body based or diet talk, as many “fitness” books include. Stanley, a native North Carolinian, shares her own journey into the yoga field. 5. Your Body is Not An Apology – Sonya Renee Taylor During a time when the world feels so unjust and unkind, Taylor offers the concept that radical self-love as a place to start to not only change our relationship with our own body, but also can be a powerful catalyst for change in our world. Taylor challenges to reader to leave behind shame and not apologize for the powerful body you have. 6. Eating in the Light of the Moon by: Anita Johnson This book, first published in 1996, uses metaphors and stories to help the reader investigate their relationship with food and weight. This is one of my very favorite books and truly a gem to have on one’s bedside table. 7. Mindful Eating Workbook by: Vincci Tsui This brand new book can be preordered now. Written by an expert HAES Registered Dietitian in the field, this workbook is sure to be a fabulous resource for my clients. The cover looks beautiful and will make a very special gift. I’v preordered mine! Do you have one of these books? We’d love to hear what your favorite book is and how it has helped you. *Sunny Side Up Nutrition is a participant in the Amazon Services LLC Associates Program and the books listed above are affiliate links. Thank you for supporting our efforts to promote positive relationships with food. Listening to the way that our culture talks about the holidays, you’d think they are 100% fun and festive for everyone. The truth is, they can also be hard for many people. For some, it can be hard seeing family that they don’t usually see. For others, it can be a lot of togetherness without enough alone time. Holiday meals and food can be a challenge for many people. Holidays may be lonely or bring up difficult memories. They can become a day with high expectations and a focus on taking care of others and/or lots of details. By the end of the Thanksgiving weekend, you may feel like you’ve given and given and you’re left feeling empty. We talk to our clients (and ourselves!) a lot about taking care of themselves so that they can take care of others. We can be a broken record, but we like the metaphor of putting on your own oxygen mask on the airplane before putting on others’. Or, another pertinent metaphor is you can’t pour from an empty cup. By being intentional about self care this holiday weekend, you may feel a little stronger and more available at the end of the festivities. We like to think about self-care as “Care Instructions” for you. 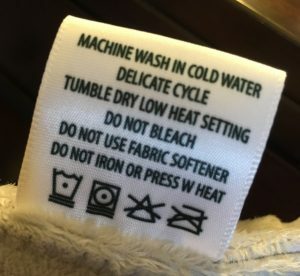 If you buy a new sweater there will be a care label with care instructions: “delicate wash, line dry.” Or a new plant may say “Keep soil moist, partial sunlight.” What would YOUR care instructions read? Anna’s would say: Needs plenty of sleep, needs to be around others, offer daily alone time, feed regularly, does better with regular movement and sunshine. Elizabeth’s are similar with some guided meditation and reading added in. What would your care label read? What do you need for certain this holiday weekend to feel the best possible, physically and emotionally? We know family meals are important. They are a strong predictor of kids’ nutrition, happiness, self esteem, and even success. Research suggests that the modeling that happens at family meals helps increase kids’ food acceptance. Family meals do not need to be complicated and it’s okay to rely on convenience foods to get dinner on the table. The benefits of family meals are not necessarily about what one is eating, they are about the family time together and the communication that happens over food. I believe if we are too black and white about what a family meal is, we can fall into a routine of not eating as a family very often, because the bar is set too high. When working with families, I’ll hear this dichotomous thinking of either cooking with recipes or having take out in front of the TV. There is a lot of grey area between these two scenarios in which family meals can happen. 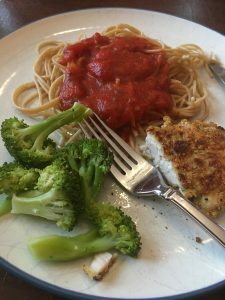 Like many of us, I’m often coming in from work or a kid’s activity right before dinnertime and, therefore, I rely on convenience or quick prep foods to get dinner on the table. I use a basic template for our meals of providing at least a protein, starch and fruit or vegetable. Providing this structure and offering different foods without pressure helps kids learn to eat different foods overtime. However, again, it doesn’t need to be complicated or gourmet. Sometimes, I need the fruit or vegetable to be quick and easy. I am often asked about how to raise children that have positive relationships with food and their bodies. One factor that comes to mind is to consider the messages your children receive about their body from their physician. 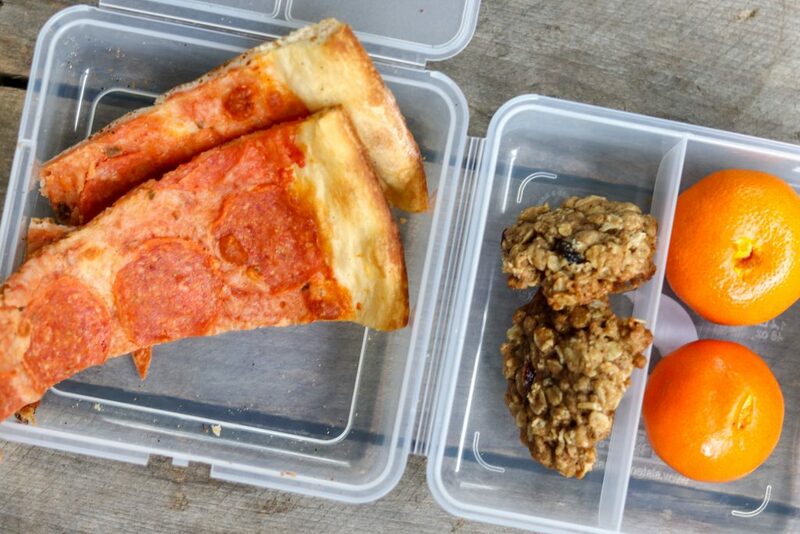 I recently wrote a post about talking to teachers and coaches about weight-neutral and age appropriate approaches to nutrition and feeding children in school. This post got me thinking about what resources I have collected for pediatricians and that the information I give pediatricians is different than what I give teachers. Pediatric visits may not necessarily be able to be completely weight-neutral, but they can certainly do no harm. In 2016, the American Academy of Pediatrics published a new statement stating that providers should not focus on weight when talking with young patients. The statement highlights the potential harm that can be caused when pediatricians focus on weight when talking with children and adolescents. However, it is standard practice for a well child visit at the pediatrician’s office to include a review of growth charts. Childhood is a time of growth and development and because of this a health assessment of a child can’t truly be as weight neutral as it can with an adult. It’s important for children’s weight and height to be monitored so that if something is interfering with growth and development it can be addressed, if needed. 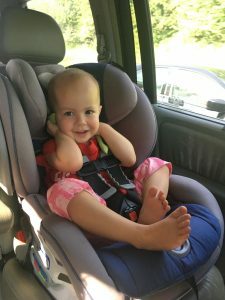 As parents, how can we advocate for our children to not be harmed by talk about weight and at the same time have these important vitals monitored as part of the health assessment? Talk with your pediatrician about how weight is discussed in front of your child. HI. Elizabeth, here. 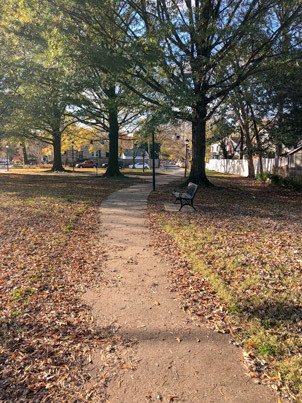 It’s been so warm and humid here in the DC area, it’s hard to believe it’s mid-October. I love fall and am looking forward to some cool, crisp days like today. 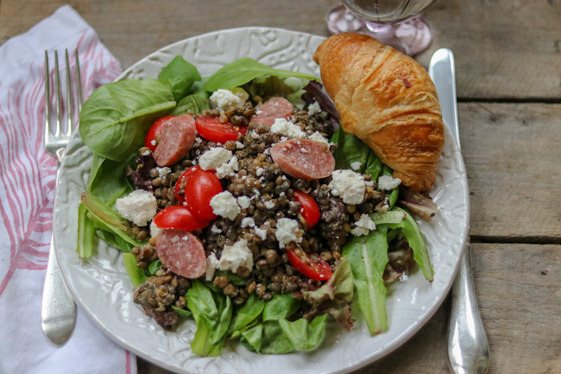 This Lentil Salad with Feta Cheese and Salami is just the recipe for still-warm fall days. It’s also hearty enough for cool days. As I mentioned in a recent post, these Trader Joe’s Steamed Lentils are one of my favorites. You can typically find them in the refrigerator case on a top shelf above the vegetables. In our house, we use them either cold in a salad like the one below or heated and served with rice and some grated cheese. My friend, Amanda adds caramelized onions and rice to them. This recipe is so easy! It really only takes a few minutes to make. I love to have it for lunch on mixed greens. It also makes a nice side dish. This salad is one of those items my kids still haven’t tried, but I keep offering it. If you have toddlers, preschoolers or even young elementary age kids, you might offer this salad deconstructed. They’re likely to be more receptive to the individual ingredients. And remember, even if your child doesn’t try a food after seeing it many times-don’t give up. They might just try it eventually. When they do, you’ll want to jump up and down and cheer, but resist the urge. As hard as it is not to cheer, remaining neutral creates a low pressure environment for trying new foods. Elizabeth, here. 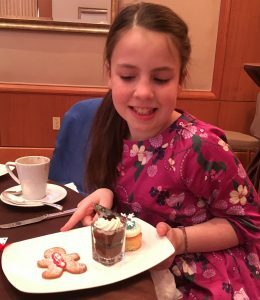 I hope you had a chance to read Anna’s recent post about the importance of eliminating diet talk from schools. And did you see our new resource to share with teachers and coaches? It makes it so easy to reach out and share your beliefs about food with anyone who works with your children. Has everyone settled into the new school year? If you’re anything like me, it’s the time of year you get stuck in the lunch-making-ho-hums. 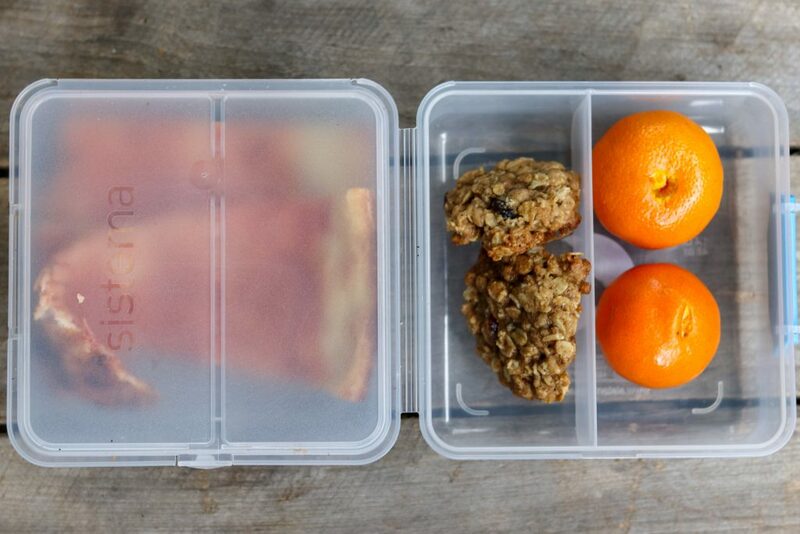 I don’t love packing lunches and get tired of it pretty quickly! 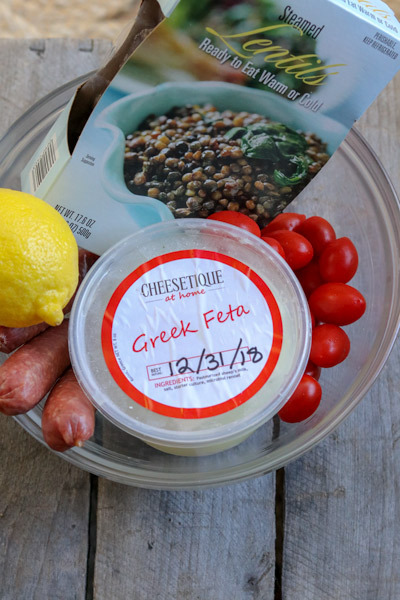 As a way to prevent the ho-hums and mix things up a bit, I thought I’d share a few more ideas for quick and easy lunches to add to the LUNCH LIST. A teenager or older child would likely need at least two slices of pizza depending on the slice size. (These are actually quite small. I had to cut this piece of pizza in two to fit it in the container). Or add a Greek yogurt or some trail mix to lunch if there’s only one slice per older child. For younger children, make a hole in the top of the clementines to make it easy for littler hands to peel them, or just peel them before putting them in the lunchbox. 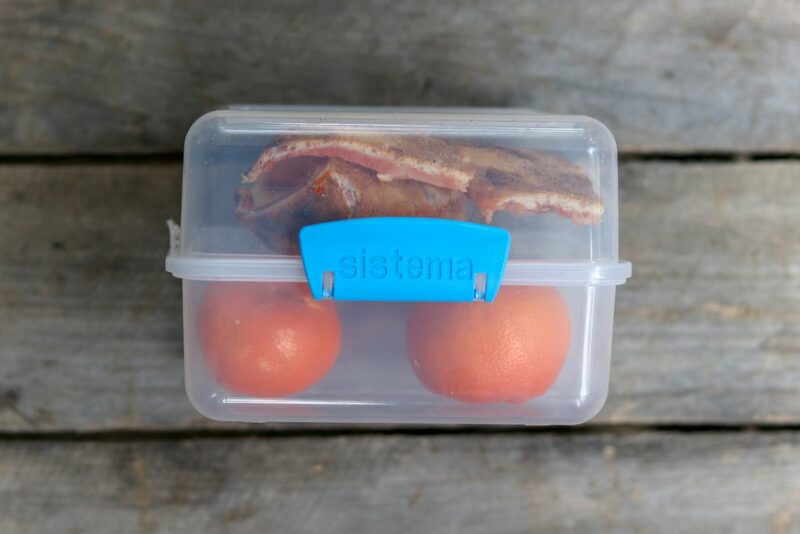 I love these Sistema lunch cubes as I mentioned here a few weeks ago. They have plenty of room for a full lunch. And the fact that the container closes between sections means less likelyhood the pizza or cookies will taste like clementines and vice versa.